I have had a dog for 10 years. Until recently, I had cut his nails ONCE. I tried it, I cut the quick, I freaked out, and I retired from dog nail trimming for the next decade. That is, until I got the courage to attempt canine nail maintenance again, and now I’m not only managing my pup’s nails, I’m saving time and money! I realized that it takes a fraction of the time to give Hero a wash in my shower than traveling to the do-it-yourself bath place where I was bathing him before. The only thing was that I’d have them trim his nails when I was there, and if I bathed him at home he’d still have long talons to deal with. I decided I was ready to DIY the whole operation, so I got this trimmer and this nail grinder - the same ones they use at the dog salon. I’ll be honest, I bought these tools and then took about two weeks to get the courage to try it out. I sat on the kitchen floor and trimmed the nails, then used the Dremel to grind the edges smooth. I needed to clean the kitchen floor, so I thought it would be good to add some grime to it before cleaning, but when it’s warmer I think I’ll just do this outside. Hero goes into a catatonic state when forced to do something he’s not into. Because of this he is VERY popular at the vet and the groomer. 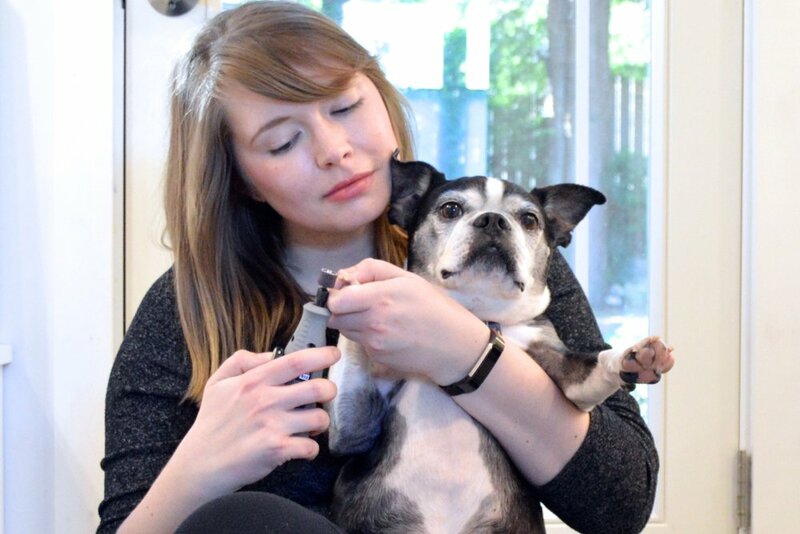 I was a little nervous about the Dremel, but Hero’s had his nails ground so many times he wasn’t scared of it, and once I got him in a good position he was fine with it. I think I took a LONG time to complete the job compared to the pros, but I’m still getting used to it and will only improve. Hero got a bunch of treats for tolerating me, and because I was so proud of us for conquering this fear. Plus, as an added bonus, buying the nail trimmer and Dremel cost a little less than what I would pay to get Hero groomed just once. I think if I’m having a high pain day or dealing with a flare I’ll still take him to the pros, but for now I’m so proud of myself (and Hero!) for taking the DIY path.